Dustless floor sanding is a flooring sanding technique introduced by several flooring manufacturers in the mid-90's. The dustless sanding & refinish or the dustfree sanding is the new way to refinish wood floors without the dust and toxic fumes. Most flooring companies use this sanding system today it just make sense!. Did you know that most of microscopic particles of wood dust generated by sanding & refinish your wood floors can remain in the room days after youve had your floor sanded. What is the Dustless Sanding & Refinish or "Dust free" Refinishing system? It is a portable machine for dust-free sanding. 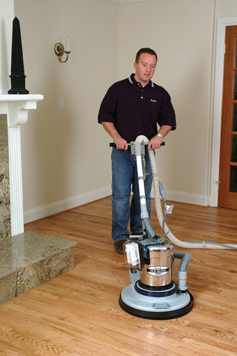 This system has powerful vacuum motor connected to all the sanding equipment and captures most if not all the dust during sanding this is thanks to the patented two-step cyclonic intake system always sucking up dust before it has a chance to escape into the air or onto the wood floor. So no more dust escape into your home or office, it captures from 97% to 99.5% of the dust in special tanks with special hospital-grade HEPA filters that capture particles down to 1 micron in size. The final component is anti-static sanding abrasive. Unlike traditional abrasives, the dust thats generated is without static charge. That makes dust particles less able to cling to surfaces and therefore much easier to manage!